All done with the installation? Looking for the user guide? Want to see your Contacts that have an upcoming birthday? With just the tiniest bit of setup you can be up and running in a few minutes. Try it out. Sign in to the Salesforce org where you would like the application installed. The first screen during installation is the profile level security. We recommend selecting the option reading Install for All Users then clicking the Install button. The application may display a screen reading "Installing and granting access to all Users..."
After the installation is finished you will receive a message similar to "Installation Complete!" You may click the button reading "Done," which will redirect you to the Installed Packages page within Salesforce Setup. The application comes with some default settings pre-built into it. However, we created a method by which you can change these default settings to better meet the needs of your Users. 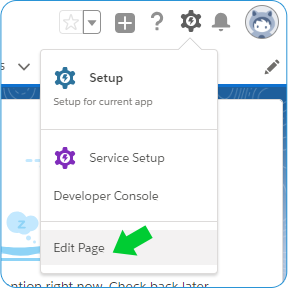 Navigate to the custom settings object within Salesforce setup. Enter "custom settings" in the Quick Find form or navigate Setup > Custom Code > Custom Settings. On the following page there will be a section for the "Default Organization Level Value" and a section for other hierarchy specific settings. Click the "New" button near the "Default Organization Level Value" section. In order for the application to be seen by the Users in your org you will need to add a widget to your Lightning page layouts. This will have to be done on all pages where you wish the application to be seen. Therefore, these steps may need to be repeated numerous times. 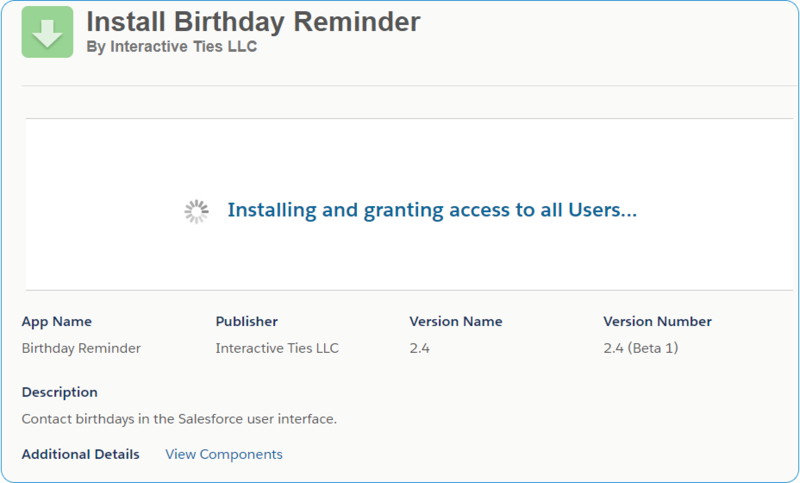 Navigate to the page within Lightning experience where you would like to add the Birthday Reminder application widget. Click the gear icon located in the upper right-hand corner of the page and select "Edit Page" from the list. On the left-hand side of the Lightning App Builder you will see list of components that may be used in the page layout. Drag the "Visualforce" component from the list to a section of the page layout editor on the right-hand side of the screen. The application has two Lightning component widgets for use in a given page layout. One that displays a vertical list of birthdays and another that displays the list horizontally. The vertical widget is a Visualforce page with the name of "birthdaysLightningVertical." It was designed for use in the right-hand side of the Lightning user interface or narrower sections of any page layout. 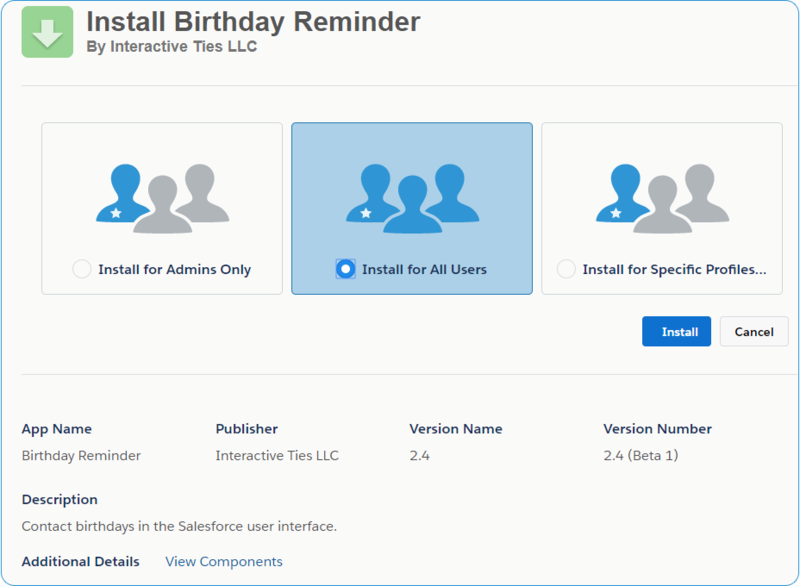 The horizontal widget is a Visualforce page with the name of "birthdaysLightningHorizontal." It was designed for use in the left-hand side of the Lightning user interface or wider sections of any page layout. The following configuration options are meant as a guide based upon the original design of each widget. Feel free to modify these settings as you see fit. Note: You will have to repeat the steps in this section multiple times in order to add the application to multiple Lightning page layouts. Still using the Classic edition of Salesforce? Don't worry we don't mind. These are the instructions for Organizations that have not yet migrated to Lightning. 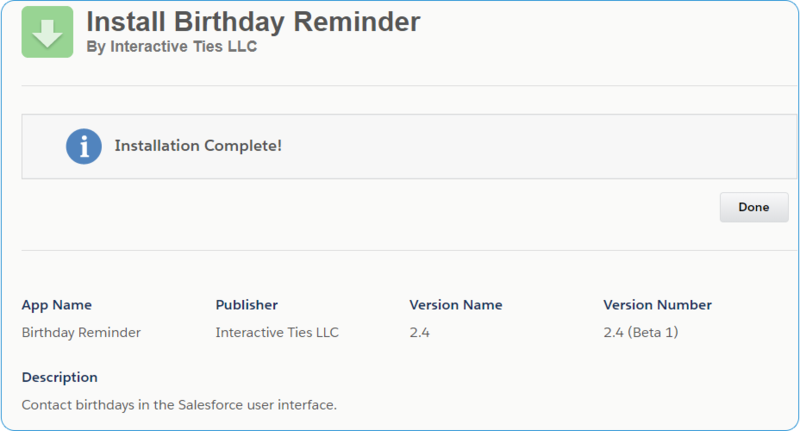 Add the "Birthday Criteria" & "Birthday Range" fields to the User page layout(s). The page will display all the Page Layouts for User records - click the "Edit" link located on the left-hand side of the User Page Layout name. Select the "Birthday Criteria" custom field from the box at the top of the page reading "User Layout." Drag the field selection to the Additional Information page layout section towards the bottom of the screen. Select the "Birthday Range" custom field from the box at the top of the page reading "User Layout." Click the "Save" button at the top of the page. Note: If your organization uses multiple page layouts for User records then you may have to repeat the above steps for each page layout. The page will display all the Page Layouts for the Home tab - click the "Edit" link located on the left-hand side of the Home Page Layout name. Check the box next to "Birthdays" under the section of the page reading "Select Narrow Components to Show." Click "Next". Use the selectors to move the Upcoming Birthdays component to the top of the page or into whatever order makes sense for the page layout. Warning: Do not use the "Upcoming Birthdays" component as it is obsolete! Note: If your organization uses multiple Home page layouts then you may have to repeat the above steps for each page layout. The page will display all the User Interface functionality for the org. Check the box next to "Show Custom Sidebar Components on All Pages" under the "Sidebar" section.